Large, heavy supplies aren't a problem for these innovative portfolios. An oversized, reinforced 4" gusset provides ample interior space. Inside are 2 pockets, plus a removable vinyl tool pouch. Outside is a large 17" x 12.5" x 1.5" reinforced, zippered pouch. 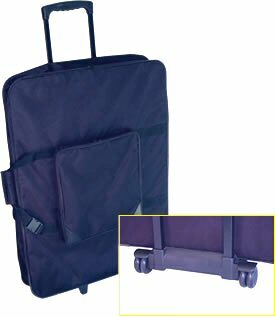 Carry it, as normal, by its padded handle...or extend its retractable handle and wheel it along on its built-in dual wheel casters. We can order this portfolio for you. If it is in stock with our supplier it would arrive on Tuesdays and Thursdays around 11:00 am. The correct item numbers will come later.